The Titans move to 2-0 on the season after a shut down win, while Merrimack drops to 0-3. Joe Berman threw a complete game shut out allowing two hits, two walks, and striking out eight. Casey Lane, Trevor Kelly, and Will Brooks had multi hit games combining for six RBIs. The Tomahawks start off the season 0-2 with a loss to Spaulding. Jack Goodwin took the loss in his first varsity start going three innings, giving up four runs, and five hits. Eric Stack led the offense going 3 for 4 and Cole Keefe went 1 for 3 with an RBI. Freshman Riley Lawhorn led all scorers with six goals to capture the win for the Sabers. Tyler Hall (five goals, two assists), Luke Manning (three assists, 11 ground balls), Palmer Belowski, Luke Civiello, and Jack Manning had four ground balls each. John Lohnes had 16 saves for the Sabers. The Tomahawks (0-2) lost the home opener in a nail biter that went extra innings. Ashley Turcotte, Liz Scheurich, and Brenna Davenport provided excellent defensive support. Erin Knauer hit in the game tying RBI to send the team into extra innings. Jess Trahan went 2 for 4 with three RBIs. It was a tough season opener for the Tomahawks against the defending Division I champion Sabers. 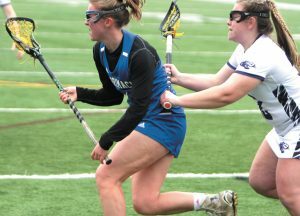 For Merrimack, Jenna Chambers and Autumn Howe each had a goal, with Chambers and Melanie Hutchinson getting assists. Bella Beaton had 12 saves in the ‘Hawks’ net.